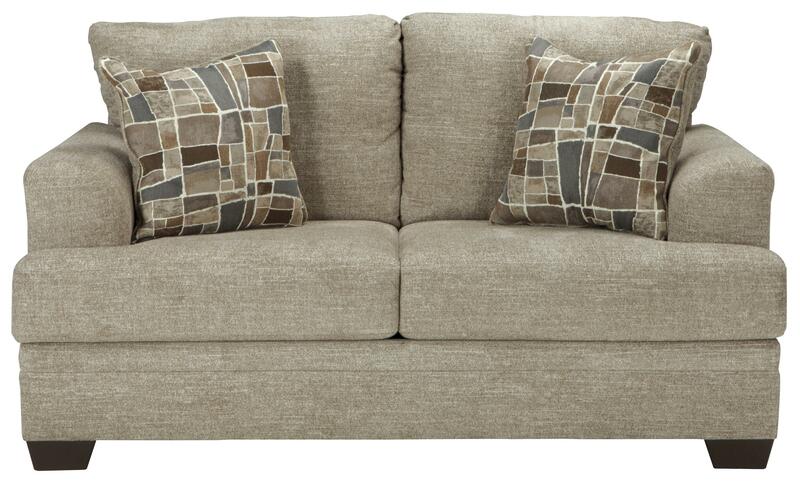 Neutral light brown tones make this loveseat a refreshing addition to your living room decor. 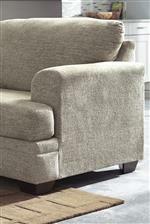 Flared arms, t-style seat cushions, and two square accent pillows add cool style to the loveseat's contemporary look. The Barrish Contemporary Loveseat with Flared Arms by Benchcraft at Household Furniture in the El Paso & Horizon City, TX area. Product availability may vary. Contact us for the most current availability on this product. Designing a new decor is easy with the casual contemporary style and versatile light brown neutral hues of this upholstery collection. Flared arms, flared back cushions, and t-style seat cushions provide comfortable seating for relaxing and entertaining at home. The Barrish collection is a great option if you are looking for Contemporary furniture in the El Paso & Horizon City, TX area. Browse other items in the Barrish collection from Household Furniture in the El Paso & Horizon City, TX area.